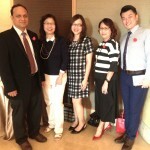 Congratulations SSTC Institute! 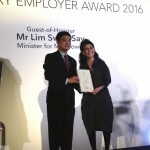 A total of 15 companies and organisations were recognised as Exemplary Employers on Friday (Apr 8) by the Tripartite Alliance for Fair and Progressive Employment Practices (TAFEP) and SSTC Institute was amongst the estemmed recipients. 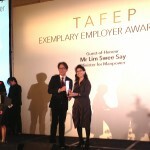 The TAFEP Exemplary Employer Award was conceived to inspire and motivate employers to adopt fair and inclusive employment practices that would ultimately make Singapore a better place to work in. 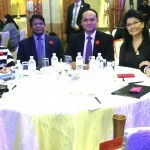 SSTC Institute was a recipient of this award as we demonstrated effective and forward- thinking employment practices, such as adoption of progressive HR policies, management of diverse workforce with synergistic outcomes, as well as a strong commitment from senior management for these practices. 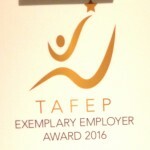 This is the second time SSTC was recognized in the TAFEP Exemplary Awards, the first being in 2014.